Note: you can click and drag to stretch the shape. 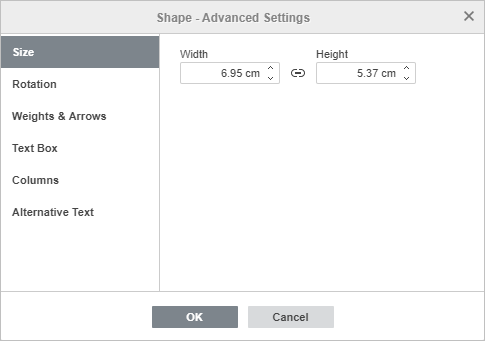 once the autoshape is added you can change its size, position and properties. 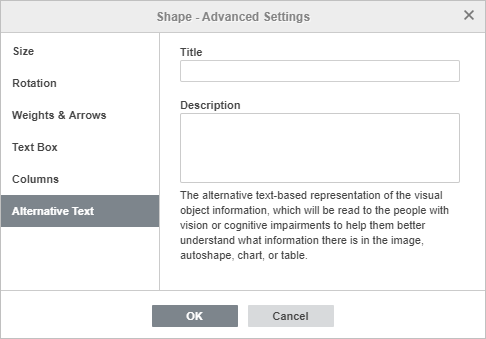 Note: to add a caption within the autoshape make sure the shape is selected on the slide and start typing your text. The text you add in this way becomes a part of the autoshape (when you move or rotate the shape, the text moves or rotates with it). Color Fill - to specify the solid color you want to apply to the selected shape. Gradient Fill - to fill the shape with two colors which smoothly change from one to another. Picture or Texture - to use an image or a predefined texture as the shape background. Pattern - to fill the shape with a two-colored design composed of regularly repeated elements. No Fill - select this option if you don't want to use any fill. For more detailed information on these options please refer to the Fill objects and select colors section. Stroke - use this section to change the autoshape stroke width, color or type. 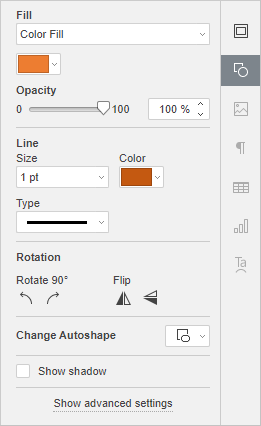 To change the stroke width, select one of the available options from the Size drop-down list. The available options are: 0.5 pt, 1 pt, 1.5 pt, 2.25 pt, 3 pt, 4.5 pt, 6 pt. Or select the No Line option if you don't want to use any stroke. To change the stroke color, click on the colored box below and select the necessary color. You can use the selected theme color, a standard color or choose a custom color. To change the stroke type, select the necessary option from the corresponding dropdown list (a solid line is applied by default, you can change it to one of the available dashed lines). 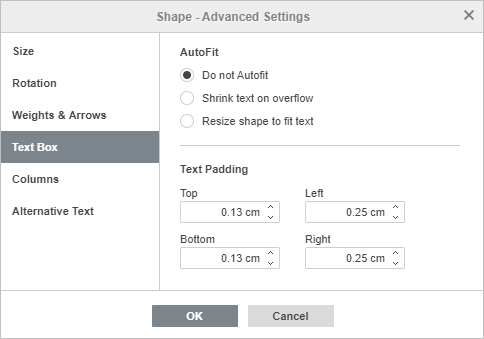 The Size tab allows to change the autoshape Width and/or Height. If the Constant proportions button is clicked (in this case it looks like this ), the width and height will be changed together preserving the original autoshape aspect ratio. Flat - the end points will be flat. Round - the end points will be rounded. Square - the end points will be square. Round - the corner will be rounded. Bevel - the corner will be cut off angularly. Miter - the corner will be pointed. It goes well to shapes with sharp angles. Note: the effect will be more noticeable if you use a large outline width. Arrows - this option group is available if a shape from the Lines shape group is selected. It allows to set the arrow Start and End Style and Size by selecting the appropriate option from the drop-down lists. The Text Padding tab allows to change the autoshape Top, Bottom, Left and Right internal margins (i.e. the distance between the text within the shape and the autoshape borders). Note: this tab is only available if text is added within the autoshape, otherwise the tab is disabled. 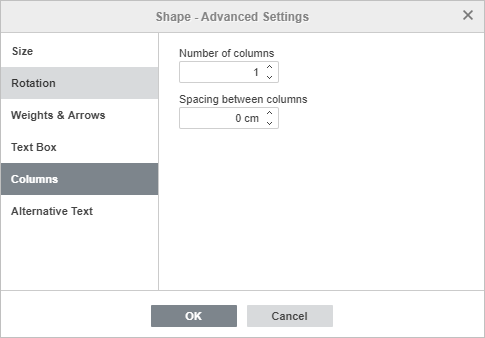 The Columns tab allows to add columns of text within the autoshape specifying the necessary Number of columns (up to 16) and Spacing between columns. Once you click OK, the text that already exists or any other text you enter within the autoshape will appear in columns and will flow from one column to another. The Alternative Text tab allows to specify a Title and Description which will be read to the people with vision or cognitive impairments to help them better understand what information there is in the shape. 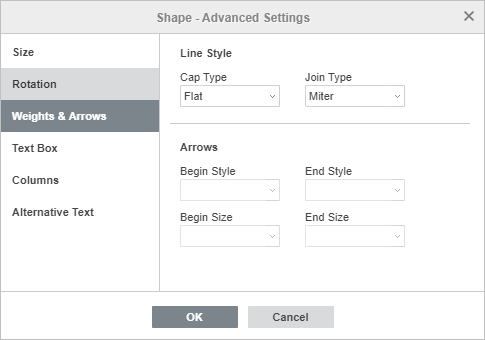 To replace the added autoshape, left-click it and use the Change Autoshape drop-down list at the Shape settings tab of the right sidebar. To delete the added autoshape, left-click it and press the Delete key on the keyboard. To learn how to align an autoshape on the slide or arrange several autoshapes, refer to the Align and arrange objects on a slide section. drag the mouse cursor towards the second autoshape and click the necessary connection point on its outline. If you move the joined autoshapes, the connector remains attached to the shapes and moves together with them. You can also detach the connector from the shapes and then attach it to any other connection points.